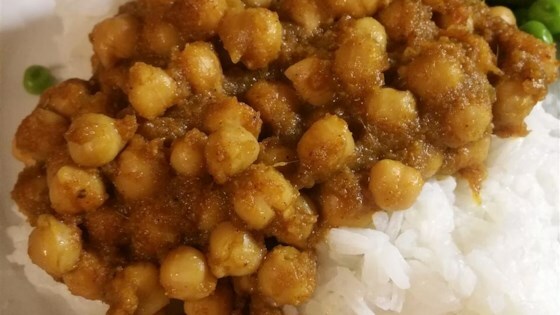 "Indian food is not just curried sauces. It's not too exotic either. Unless 'exotic' is code for 'yummy and full of flavor.' This dish features a healthy mixture of chickpeas, tomatoes, onion, and spices. Both carnivores and vegetarians will enjoy this meal. My kids love it. Leave out the green chile if the kiddies will be eating. Serve over basmati or jasmine rice and enjoy. Namaste y'all!" Serve with my 'Mattar Paneer' recipe for a totally authentic Indian dinner. As an optional serving suggestion, use the "Indian Naan Bread" recipe instead of rice as a companion to this dish. Absolutely, fantastically, delicious. My son's East Indian girlfriend gave it her blessing and said it was a very authentic tasting dish. For that, I'm thrilled. I just chopped the vegetables, I did not make this into a paste. The taste was hot and spicy, the way I enjoy my food! Loved it! The only thing I'll do differently next time is sauté the onions and garlic before blending them. They never quite cooked, but even still the end result was pretty great. I loved this recipe! The second time I made it I used canned tomatos and it turned out just fine! I prefer fresh, but in a pinch canned worked well.